It’s impossible to fathom a time where we’d tire of eating pizza or pasta, which is good because thanks to Salt Meats Cheese we’ll never be in short supply. The popular Sydney-born Italian eatery concept has been steadily cementing its foothold in Queensland since the 2015 opening of its Gold Coast location. The next phase of Salt Meats Cheese’s expansion has brought it to South Bank, where it is partnering up with Accor to open its newest dining spot at the base of Mantra on Grey Street. Officially opening today, Tuesday April 9, Salt Meats Cheese South Bank will deliver its signature relaxed fare and atmosphere, as well as some fabulous offerings for Mantra’s lucky guests. It didn’t take long for Brisbane diners to catch on to what Salt Meats Cheese brought to the city’s culinary scene. Since Edoardo Perlo and Stefano de Blasi first transported their culinary concept to Brisbane from Sydney in 2017, eaters have responded positively to the brand’s laid-back hospitality and tantalising Italian fare. The latest phase of Edoardo and Stefano’s expansion plans marks an exciting partnership with Accor Hotels, which has welcomed Salt Meats Cheese as the on-site dining offering for its Mantra South Bank premises. Slotting in where Stone Restaurant and Bar once sat, Salt Meats Cheese South Bank is bringing its brand of hearty eats to the bustling cultural and dining hub, adding an enticing additional option to the mix. Mantra’s light-filled dining space has been given a sprucing, removing traces of Stone Bar & Restaurant’s aesthetic and implementing a fresh design that enhances the tenancy’s best elements. Greenery and natural tones feature heavily, juxtaposed with light-industrial elements. 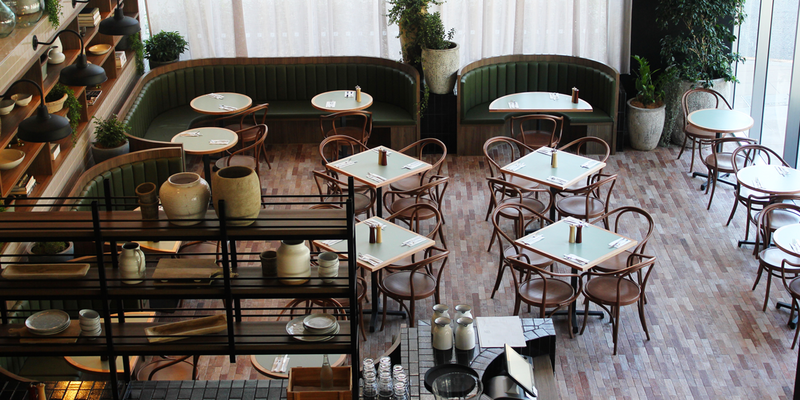 Glass racks, brass surfaces and modern light fixtures offset brick tiling, timber furnishings and green-leather banquettes, with an airy vibe maintained from bar to booths. An al fresco area along Grey Street allows for leisurely tipples and casual people watching, bringing the total capacity to 130 seats. Those that have dined at Salt Meats Cheese in Newstead or at The Garden Pantry will likely be familiar with South Bank’s menu, but rest assured – there are some tasty additions in the mix. 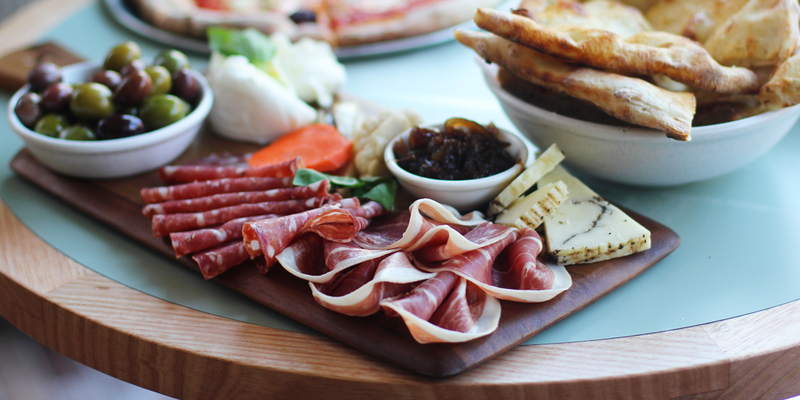 Like its sibling locations, Salt Meats Cheese South Bank’s menu encompasses antipasto platters, pasta dishes, red- and white-base pizzas, calzoni and desserts. Standout items include crab tagliolini, pumpkin risotto, stuffed lamb neck, bar snacks like saffron arancini and more. Over at the bar, diners can sip on local and imported beers, wines, spritzes and cocktails exclusive to the South Bank location, including a barrel-aged negroni, a tiramisu espresso martini and a Sicilian old fashioned. The biggest boon, however, goes to Mantra’s guests, who are treated to a grazing-style breakfast of Italian pastries, grab-and-go eats for those eager to get amongst the action and Australian breakfast classics with a sprinkle of Italian flair. Guests that are more inclined to put their feet up after a day sightseeing can order menu items to their room at any time of the day or night, which is the kind of top-flight room service we wholeheartedly appreciate. 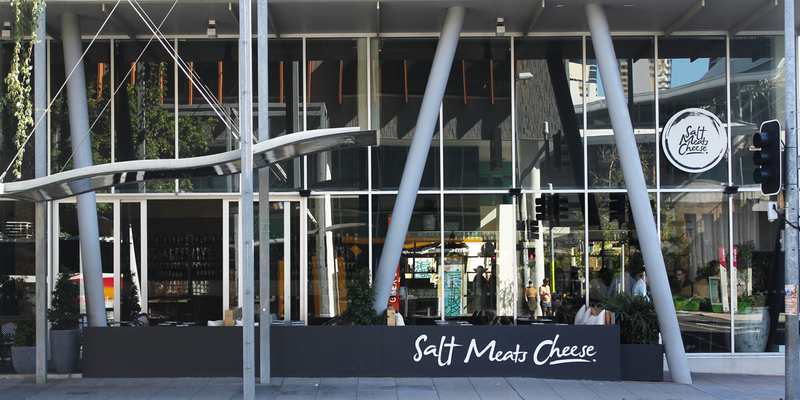 Salt Meats Cheese at Mantra South Bank is now open. Head to the Stumble Guide for opening hours and contact details.